In March, Kelly participated in “Millennials: Changing the Landscape of Public Relations,” a panel conversation hosted by the Pubic Relations Department at the S.I. Newhouse School of Public Communications at Syracuse University. Kelly, along with experts from The Digital Hyve, Site Seeker and Wegmans Food Markets, discussed the ways in which the Millennial generation continues to transform how businesses are communicating and marketing. Having earned her APR credential in 2018, Kelly was invited to speak about Accreditation at the New York School Public Relations Association annual conference. The panel presentation provided expert insights from three APRs who shared the importance of earning the credential with fellow communicators from all over New York State as well as advice to help communications professionals succeed in completing the process. In today’s media climate people are bombarded by upwards of 3,000 messages a day. This not only results in a challenge for practitioners to help organizations break through the noise, it puts a spotlight on media literacy for children. Helping young people understand the messages that they experience every day helps them better understand the messages they receive and the sources they use to obtain information. 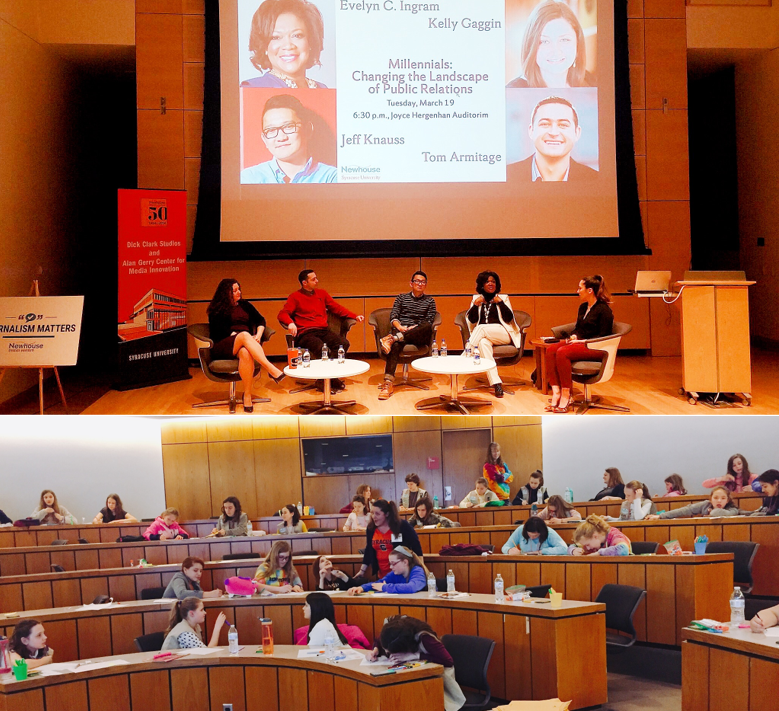 On April 6, Kelly participated in the “MEdia Journey” workshop with Girl Scouts of NYPENN Pathways and hosted by Newhouse. More than 100 girl scouts attended the all-day event which educated them about mass media channels and messaging. Kelly facilitated a session focused on understanding the cover language on popular women’s magazines and gave scouts the opportunity to create their own magazine covers that represented their interests and values focused on body positivity and empowerment.